We're teaming up with pandahall.com again for this great tutorial that I have for you today. 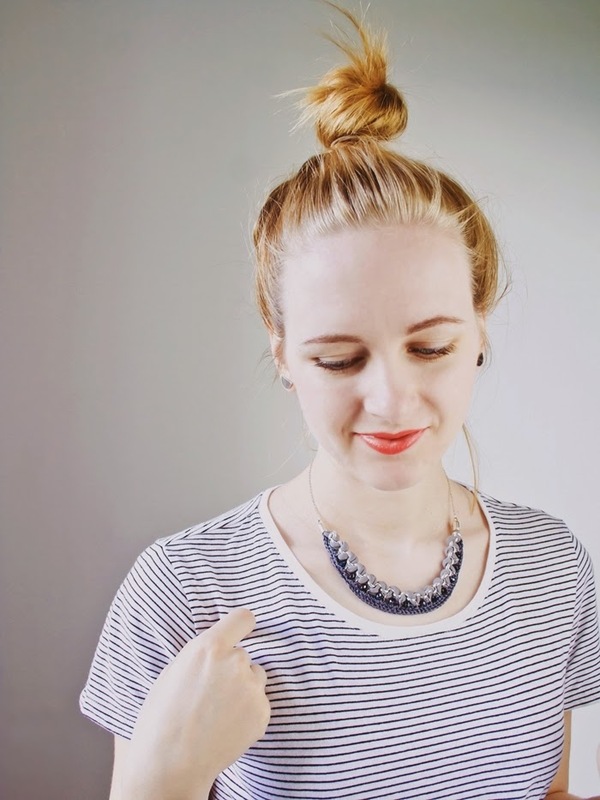 This crochet statement necklace is one of my favorite jewelry DIY tutorials of all time! It's so gorgeous. And I'm not just saying that because I made it. I would totally buy that thing. But before you stop reading because you think 'That necklace looks insanely difficult to make. I'm leaving.' or 'I'm a complete beginner in jewelry making, I can never make something so advanced.' or something like that - It is NOT difficult. It is not. 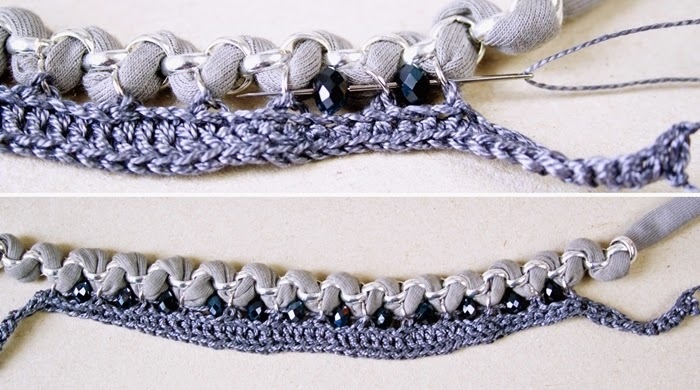 If you know how to open and close jump rings and know basic crochet stitches (chain stitch, single crochet, double crochet) you can totally do this! The tutorial is lengthy but I tried to explain everything as clear and easy to follow as possible. 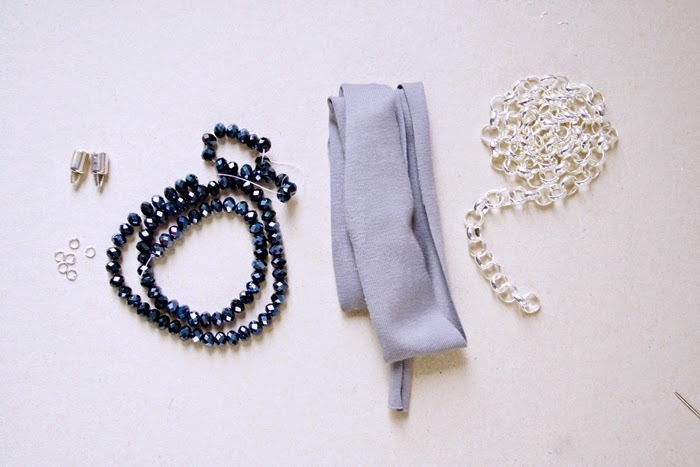 I always feel that the most difficult part about making a great statement necklace is to plan the design and to buy the right supplies. I already did the planning for you and I can help you with the supplies as well. 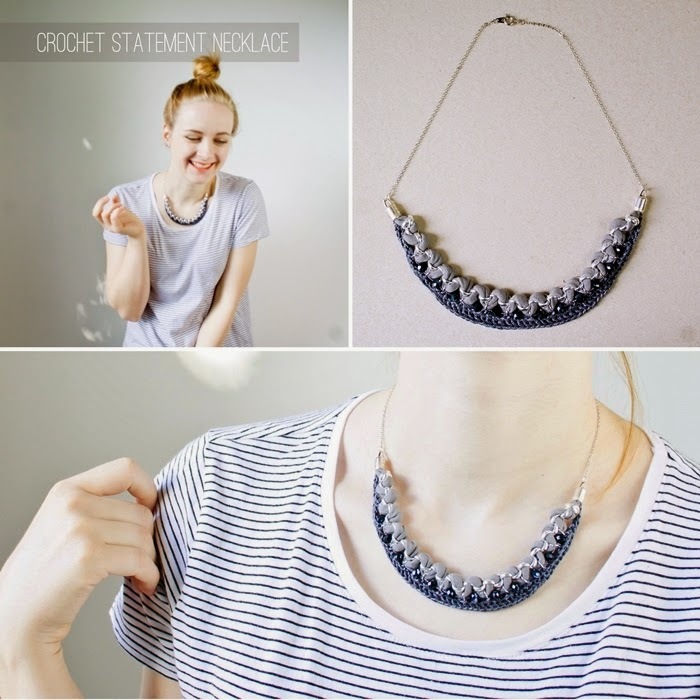 So let's jump right in and make a crochet statement necklace! 1. At this point I usually draw a sketch of what I want the necklace to look like. with the jersey woven through the chunky chain and the crochet part I found that difficult to draw, but arranging like in the picture above works, too. It helps to get a feeling for size and dimensions, too. The chunky chain is already cut to my desired length in that picture. You do that just by cutting it with a sidecutter. If you don't use t-shirt yarn but jersey fabric, you now cut a longer piece that is about 4 cm wide and stretch it thoroughly. 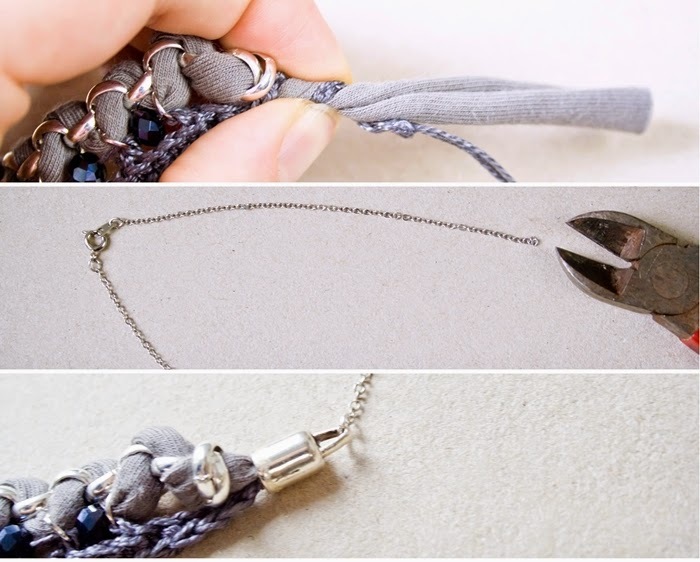 The edges will toll inward and you will end up with beautiful t-shirt yarn that is easy to use in the following steps. 2. Use the bobby pin as 'needle' for the t-shirt yarn. Lay the big chain in front of you and straighten it out, so the chain links are always at a right angle to each other. Now thread the jersey through the links. Go from back to front for the first link and from right to left for the second, back - front, right - left, back - front, and so on. It's not that important in which direction you thread through the chain, but it's important that it's the same direction every time. You'll see a pattern form after a few links. Continue to the end of the chain. 3. So, you see that wavy pattern that the jersey makes, right? Up and down and up... The next step is now to put jump rings (7mm) around the bottom parts of the wave. This can be a bit tedious, but we are not in a rush, are we? Take your time. I left the two or three waves at the ends without jump ring, but you could continue until you reach the end. 3. Now comes the fun part! Take your cotton yarn and the crochet hook (3mm) and let's crochet! Start by making 10 chain stitches. Now connect with the first jump ring at one end of the chain. To connect, go through the jump ring in the opposite direction you are working in and pull the thread through (I went from right to left, so the crochet hook has to go from left to right through the jump ring). You have now two loops on the hook. Pull the yarn through both. Continue in chain stitch until you reach the next jump ring. For me that was three chain stitches between each jump ring. continue in this fashion until you reach the last jump ring. 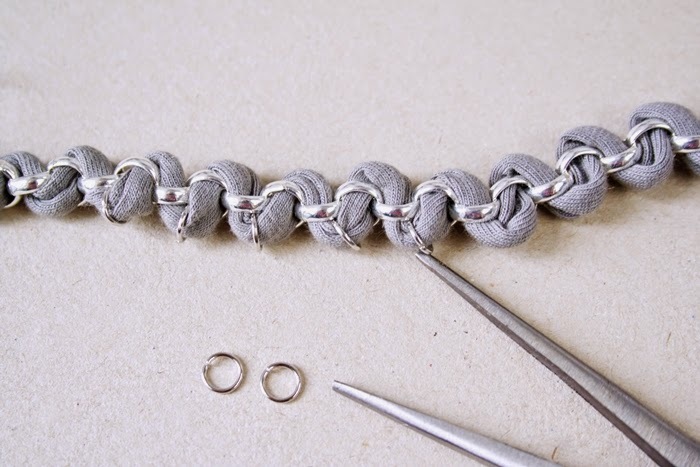 Connect and add 10 chain stitches at the end. 4. Turn your work like it's a normal crochet work. Work the next row in single crochet until you reach the third jump ring. Double crochet until there are three jump rings left. Finish in single crochet. Cut the thread and pull it through the last loop. 5. Now add the beads. I simply threaded the cotton thread onto a needle, put the beads into the spaces between the jump rings and pushed a needle through from left to right. Fixate at the ends, weave the ends in and you're done. Easy peasy. 6. No we're already at the finishing touches. First, add the end caps. To do so you twist the jersey and the crochet cotton thread ends together very tightly. Hold and cut very close to your fingers. Put a drop of glue into the end cap and put it onto the twisted ends. Repeat for the other side. Let dry. 7. Cut the thin chain to desired length (remove the bottom part). Make sure, the closure stays in the center of it. With a smaller 4mm jump ring connect the chain with the end caps. Tadaa! 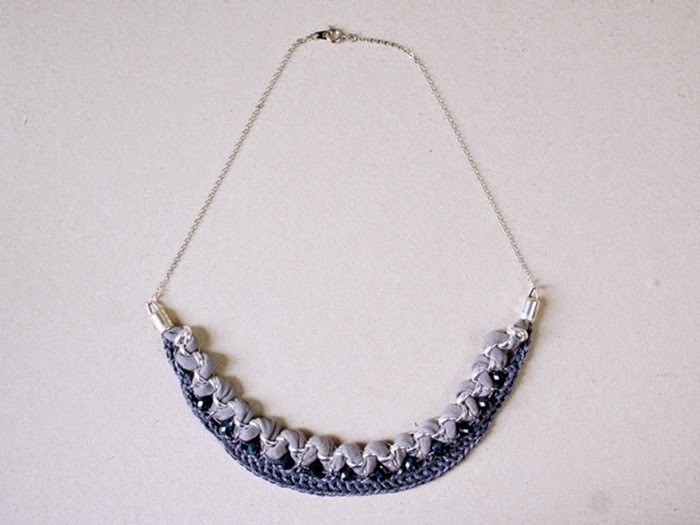 I love my crochet statement necklace! I love the cool grey tones because they can go with basically everything. 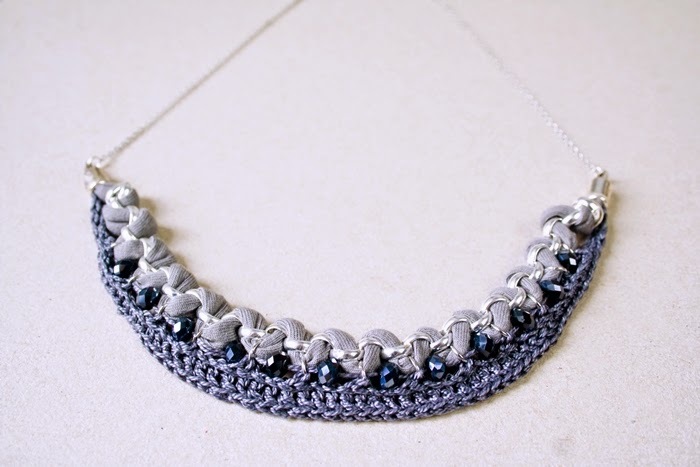 But I can imagine that the necklace would look just as great in brighter colors or with beads or crochet part in a contrasting color. What do you think? What a neat idea! If I could make a suggestion, though, why not string the jump rings on the t-shirt yarn while you are stringing it through the chain? I think it would be easier done then than trying to maneuver them on later. 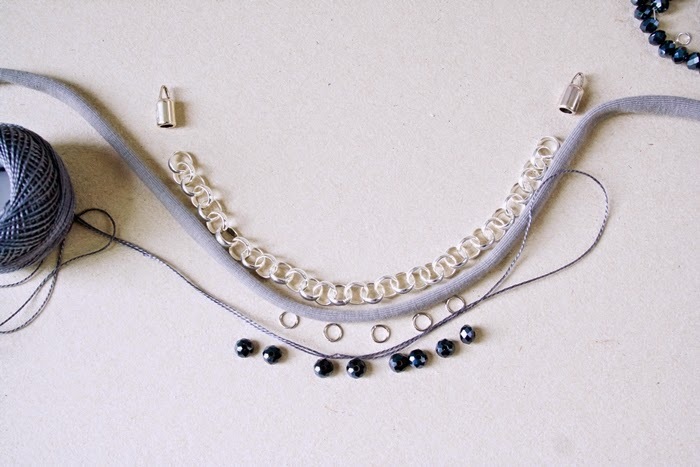 Hey Kathie, Its great blog about how to make this beautiful necklace and i love this and i will also try the same. Thanks for sharing it with us.